The Small Business Finance Forum is a resource provided by The Resourceful CEOTM to help aspiring entrepreneurs, micro business owners, and small or lifestyle business owners identify funding and other resources that will provide them with what they need to start and grow their businesses. Definitions: Aspiring entrepreneurs are those that do not currently own a business but aspire to, or they may be in the process of starting one. Micro business owners are those with businesses that generate $100,000 or less each year. Small business owners are defined here as those with businesses that generate $100,000 to $3 million in revenue. (These are NOT the SBA's definitions, but our definitions to illustrate who we serve and why.) Lifestyle business owners are those who purposefully keep their businesses small to match the lifestyles they want. What do all of these groups have in common? Limited resources. Limited resources take the forms of limited knowledge, limited access, limited time, limited funds,... The Small Business Finance Forum's goal is to provide these business owners with resources - tools, tips, insights, software, programs, funding sources, and so much more that is free or low cost or that provides the needed resources in a high impact way. This means, the goal is to provide bang for the buck - the more bucks required, the more bang expected! The other objective is to help these business owners feel that, although they are small, they can identify numerous resources that can help them grow...and we help them do just that! TIFFANY C. WRIGHT is the author of The Funding Is Out There! 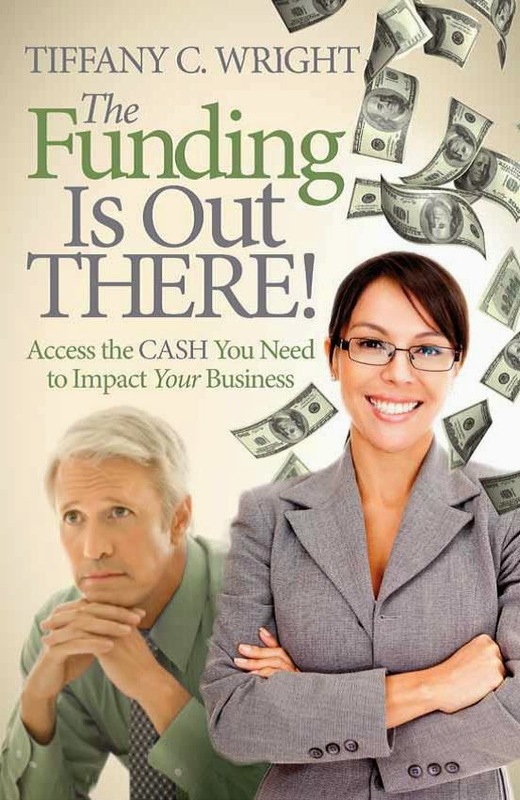 Access the Cash You Need to Impact Your Business (Morgan James Publishing, Oct. 2014), Solving the Financial Equation: Financing Solutions for Small Businesses (book, Amazon) and Help! I Need Money for My Business Now (eBook). Tiffany is the president of The Resourceful CEOTM. Over the last seven years, Tiffany has helped small companies obtain over $40 million in financing and a similar sum in contracts and purchase orders, first as a small business advisor then as an interim CFO and COO. Tiffany has provided mergers and acquisition, turnaround and restructuring advisory, financial analysis, partner development, strategic market pursuit, operational support, and business strategy assistance.Tiffany has over 17 years of finance, strategy, management, and operational experience in a variety of industries including business services, financial services, high tech, and real estate. Tiffany is also a serial entrepreneur. She formerly started and ran a residential real estate investment firm which operated in California, Texas and Georgia. She also purchased and ran a commercial construction trade publication with a 100% virtual work force. Tiffany has worked internationally, including a 2.5 year stint abroad in Asia (Japan). She has also held several corporate positions at Siebel Systems, Enron, and Honda. Tiffany obtained her MBA in Finance and Entrepreneurial Management from the Wharton School of Business at the University of Pennsylvania and her B.S. in Industrial and Systems Engineering from The Ohio State University. Tiffany sits on the board of North Carolina Arts in Action and is a former president of Team Ivy Breakfast Networking, Inc. and is a Junior Achievement Fellows volunteer. She is also a member of the National Association of Female Executives, a volunteer mentor, and a regular speaker at small business and finance events. *Note that this blog accepts advertising and occasionally accepts payments for articles.